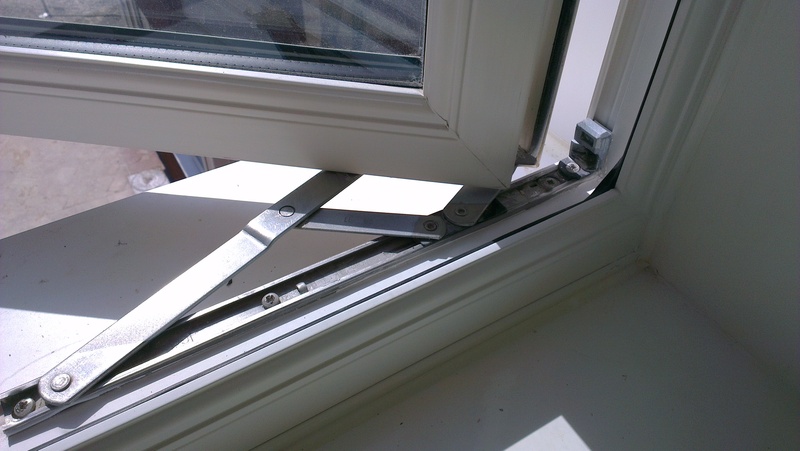 A UPVC window repair can be made regardless of the damage, skilled technicians can restore all damaged UPVC windows whether it is chipped, scuffed, stained or badly damaged. UPVC windows repaired regardless of the damaged items color or finish, even damage substructures and framing can be repaired. 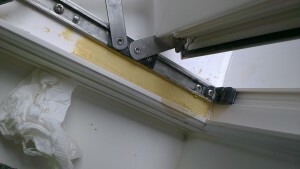 There is no need to remove the damaged or dis-functional frames from the opening as our technicians can carry out the repairs on site with the structures in place creating less damage and no mess. During the the course of the restoration our friendly technicians carefully lay out a protective covering in the room or area that the particular repair needs to be done in and they clear everything and hoover the area leaving no trace of their presence. Above you can see an example of a cill that had been over levered by a fitter in an attempt to level the frame, the fitter had put far to much pressure on the UPVC frame and failed to notice the head of the frame had met the steel lintel. The excessive force the fitter had used resulted in the vent window stay being forced into the window frame, taking a large amount of the frame with it. Our specialist technicians arrived on site, filled the void with our hardened fillers, replaced the damaged stay and then finished of the frame with a coating, leaving the damaged area looking new again, as you can see in the pictures the damage is completely restored back to its original condition and the hole job was done within an hour.